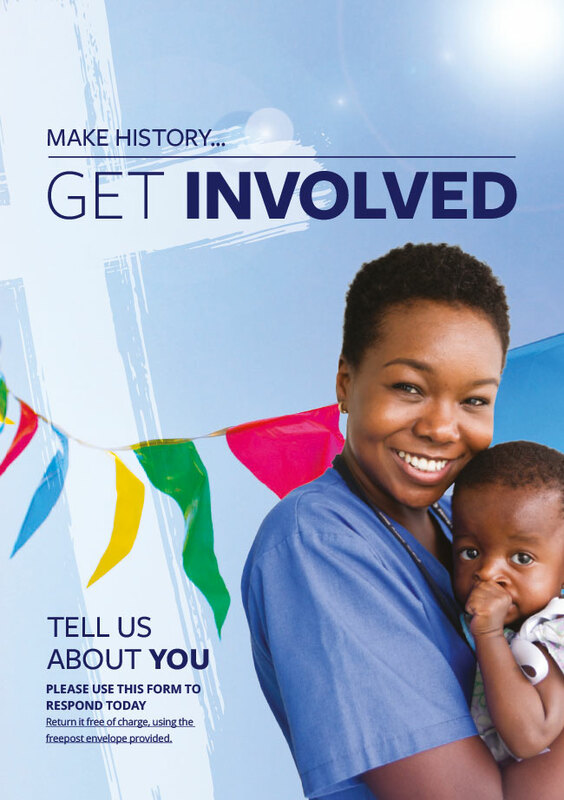 If you are part of a church that wants to connect with Mercy Ships, we’d love to speak to you. We’re passionate about seeing churches use their gifts to act justly and love mercy, by helping to change lives in Africa. 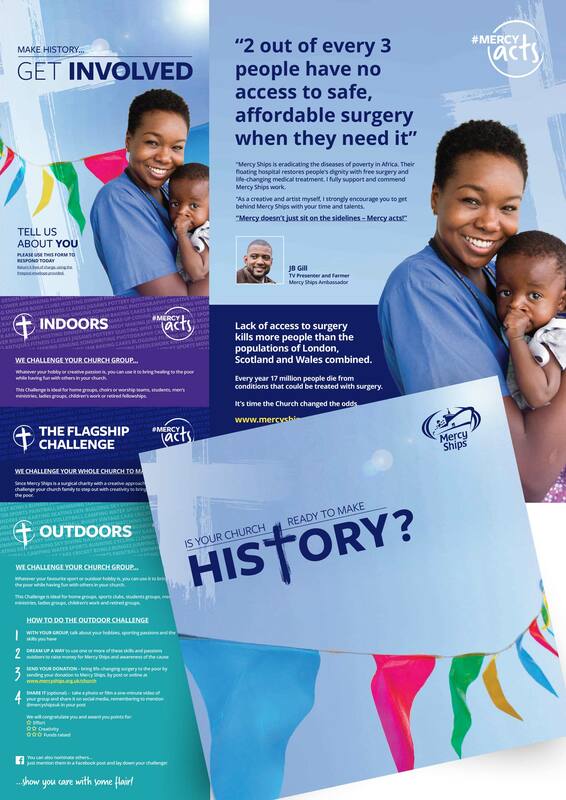 We developed some fantastic church resources to help you share the life-changing work of Mercy Ships with others in your church, and get them fired up about eradicating diseases of poverty in Africa. Are you ready to make history? All of these resources can be downloaded below, including a devotional for home groups called ‘Faith in Action’. 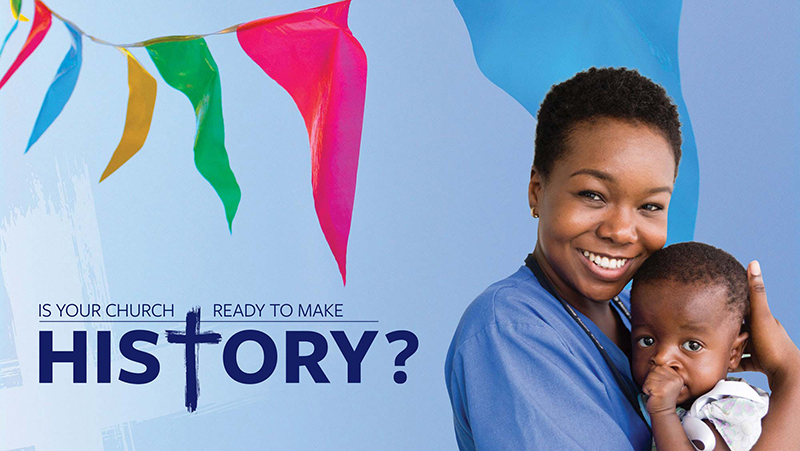 If you have any questions, or want to get in touch for whatever reason, please email our church partnership manager, Darren Richards, at churches@mercyships.org.uk. The main part of our new church pack is this booklet. 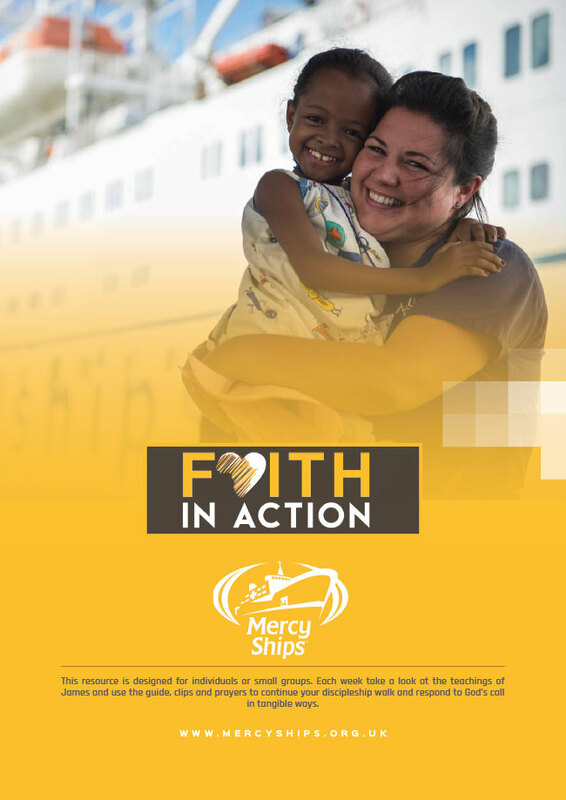 The booklet explains how Christians have made history, tells the story of the 40-year legacy of Mercy Ships, and explains how you can get involved and make history as a church. It’s really easy to navigate and full of ways to energise your church into action to help some of the poorest people in the world. Whoever you are, there’s something you and your church can do! These are the MercyActs challenge cards. 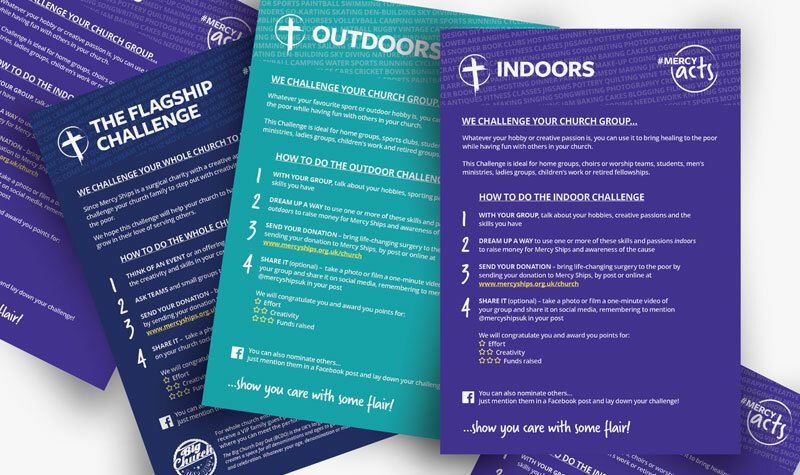 As well as the Flagship Challenge, there are challenges you can do indoors and outdoors, bringing your church community together in creative, fun ways. There’s something for everyone here… these cards are perfect for home groups, men’s groups, women’s fellowships, senior citizens, youth groups and children’s work. You could even win backstage tickets for Big Church Day Out. Everyone in your church can do something – everyone can show they care with flair! Click here to download the full pack in one PDF – booklet, challenge cards, response form and poster. 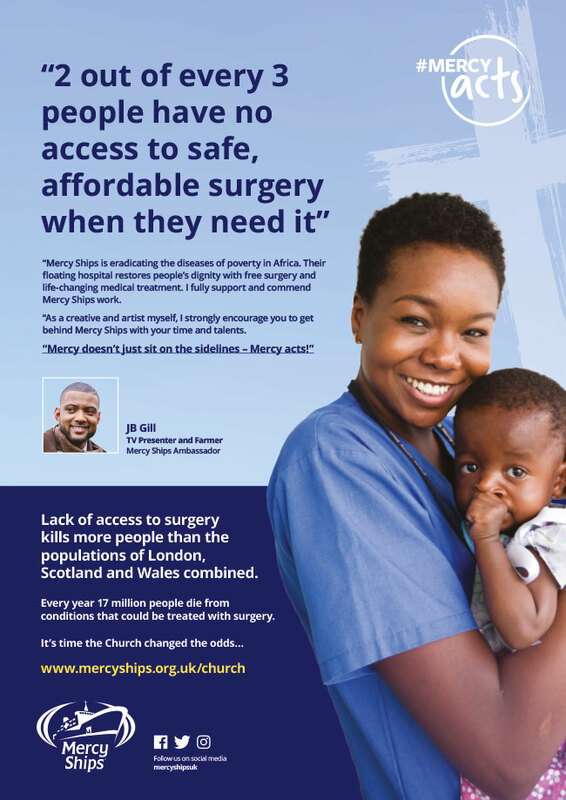 Get your free download of this MercyActs poster in A2 format for you to print out and pin up in your church. We also have a fantastic devotional for your church small groups, based around the Book of James. 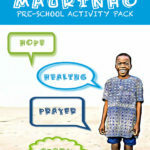 Our downloadable pdf was created as part of our partnership with Spring Harvest. It includes plenty of inspiration for putting your faith into action and making history. And here is the response form for you to tell us all about you, your church, how we can best serve you, and how you’re interacting with our resources. Here are our packs for children and young people, which are free to download. Using these resources, they can learn about Mercy Ships and one of our orthopaedic patients, Maurinho. 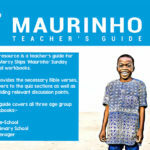 Watch a short video about Maurinho here. Click to download our resources pack for pre-school groups. Click to download our resources pack for primary schools. 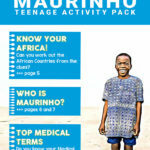 Click to download our resources pack for teenagers. Click to download our guide for Sunday school teachers, children’s workers and youth leaders in churches using these packs. I am a church leader. I lead a home-group or ministry area.